Swapping football shirts at the end of a game is usually a sign of respect. Not so much in Milan's game against Lazio. 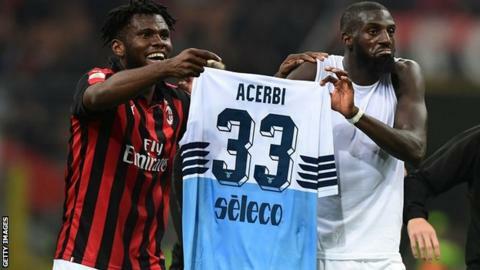 Tiemoue Bakayoko and Franck Kessie have both apologised for holding up Lazio defender Francesco Acerbi's shirt like a trophy after Milan's 1-0 home win on Saturday. Before the game Acerbi said in an interview that there was "no comparison" between the teams' players and that Lazio were "stronger". Bakayoko, on loan from Chelsea, took umbrage and tweeted 'OK Acerbi see you Saturday'. After the game, Acerbi, who played 10 times for Milan in 2012-13, swapped shirts with Bakayoko in a bid "to put an end to the issue". But the Frenchman and Kessie, who scored the only goal, briefly held the shirt up so their fans could see it as Milan players went to celebrate their win in front of their supporters. "Fomenting hatred is not sport but a sign of weakness," said Acerbi on social media afterwards, with team-mate Ciro Immobile calling the Milan duo "two little men". The pair apologised on social media on Saturday evening, Bakayoko saying it was "a playful gesture" and Kessie saying he "just wanted to joke, nothing more". Milan issued a statement on Sunday saying the incident had "no mockery, no aggressive or anti-sporting intentions". It added: "Milan is founded on values ​​such as respect [on and off the field], equity, inclusion. Tiemoue and Franck know, share and express those values ​​every day." Lazio are now six points below fourth-placed Milan in the battle for a Champions League place.